The above info came from Hitchi & Kine, and was edited by yours truly (contact me). The image came from teemix.aufeminin.com. Tsubasa Chronicle is based off the manga by CLAMP with the same title. The majority of the characters are from previous CLAMP series, so Tsubasa is often called a crossover. However, the plot is entirely original. In addition, the seiyuu are different than they are in original anime. For example, Sakura's seiyuu in CCS is Sakura Tange, but in Tsubasa, she is Yui Makino. Sakura is the princess of a kingdom that she and Syaoran live in. Syaoran and his father came to the kingdom when he was young in order to excavate the ruins on the outskirts of town. Sakura and Syaoran became very close childhood friends. One day, Sakura is drawn to the ruins. Through their mystical power, she grows wings. They disintegrate into many unique feathers, each one a memory of hers. In order to save Sakura's body, mind, and heart, Syaoran must travel to many dimensions/worlds in order to retrieve the feathers. Yukito, the high priest of the kingdom, sends Syaoran to Yuuko, the dimensional witch. There he also meets Kurogane, who will do anything to go back to his kingdom, and Fye, who will do anything to avoid returning to his original world. In order to do this for them, Yuuko must take each of their most precious items (I won't spoil what they are...it's very interesting, so you have to see it for yourself!). Fye and Kurogane, as well as the little mascot/translator/puffball Mokona, join Syaoran as he seeks out Sakura's feathers of memories. Tsubasa: Reservoir Chronicle is recommended to everyone, even those who are not really fans of CLAMP's works. With a great mix of drama, fighting sequences, and touching and philosophical scenes, there's something for you, no matter where your interests lie. The above description came from Hitchi & Kine, and was edited by yours truly (contact me). 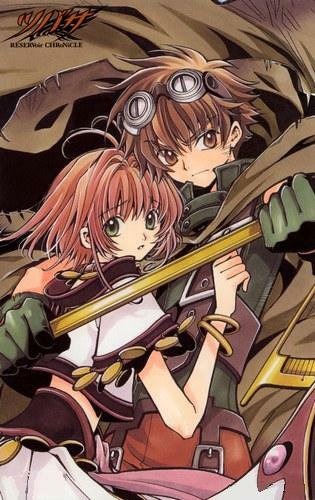 Syaoran, a young archaeologist, and princess Sakura are long child hood friends. When Syaoran returns home from his latest expedition, Sakura tries to admit her feelings to Syaoran, but is interrupted. Not having the chance to tell Syaoran that she loves him, Sakura makes a visit to the site of his latest excavation. A giant symbol has been found on the ground of one of the underground tunnels. Sakura, upon touching the strange symbol, loses all of her heart and memories. Now Syaoran, "The Chosen One", must venture through different worlds and dimensions in order to retrieve Sakura's memories! The above description came from Minira, and was edited by yours truly (contact me).